I love making mud pies for any occasion. It’s a dessert recipe that you don’t really need to be so precise so I can experiment a lot. I add more whipped cream, I add more toppings, and I add a few extra ingredients that can make it as my own version. You can never go wrong with this dessert recipe. 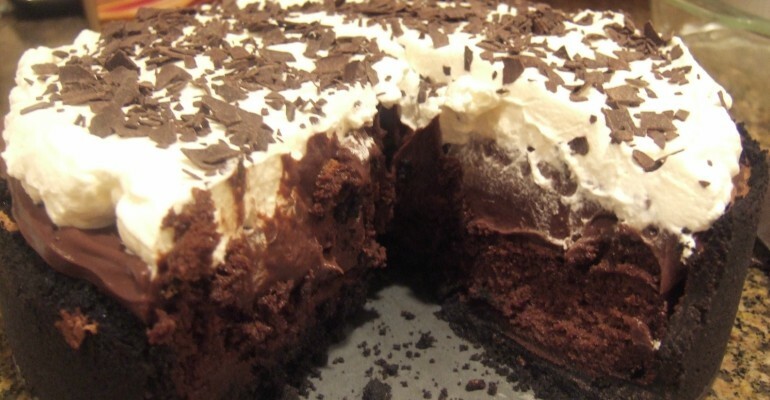 It’s chocolate and cream; ingredients that when combined always turn out so delicious. You can be more creative with this dessert. Go crazy with the ingredients if you want to. There will be no complaints, I’m sure. Make the crust: Preheat the oven to 375 degrees F. Pulse the graham crackers and pecans in a food processor until finely ground. Add the melted butter and process until moistened. Reserve 2 tablespoons of the chocolate crumb mixture for topping, then press the rest into the bottom and up the sides of a 9-inch pie plate. Bake until set, about 10 minutes; transfer to a rack and let cool. Meanwhile, make the filling: Melt the butter and chocolate in a medium saucepan over medium heat, stirring. Remove from the heat, then stir in the flour and salt until smooth. Stir in the sugar, corn syrup, coffee liqueur and vanilla. Add the eggs, one at a time, stirring until smooth. Pour the filling into the prepared crust and bake until set and cracked on top (like a brownie), about 30 minutes. Transfer to a rack and let cool slightly, about 2 hours (the pie should still be slightly warm). Make the whipped cream: Beat the heavy cream, confectioners’ sugar and vanilla with a mixer until soft peaks form. Top the pie with the whipped cream, pecans and reserved chocolate crumb mixture. Drizzle with chocolate sauce. Quick Tip: You can add more whipped cream on top and you can give that extra drizzle of chocolate syrup. I added chocolate flakes. Thank you Kate Cooks The Books for this fabulous photo.